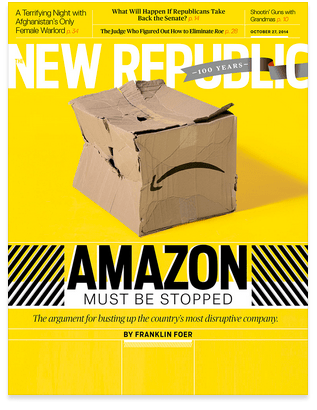 THE battle over Amazon — including the siege of Hachette — has heated up lately, with The New Republic’s Franklin Foer and several prominent authors, including Ursula Le Guin, calling the online bookseller “a monopoly.” Foer has argued that it’s time for the Department of Justice to break Amazon up. That term doesn’t get tossed around much these days, but it should. Amazon is the shining representative of a new golden age of monopoly that also includes Google and Walmart. Unlike U.S. Steel, the new behemoths don’t use their barely challenged power to hike up prices. They are, in fact, self-styled servants of the consumer and have ushered in an era of low prices for everything from flat-screen TVs to paper napkins to smart phones. ved to manage an industrial economy—and have, over time, evolved to focus on a specific set of narrow questions that have little to do with the core problem at hand. Whether Amazon, which does $75 billion in annual revenue, has technically violated antitrust laws is an important matter, of course. But descending into the weeds of predatory pricing statutes also obscures the very real threat. In its pursuit of bigness, Amazon has left a trail of destruction—competitors undercut, suppliers squeezed—some of it necessary, and some of it highly worrisome. And in its confrontation with the publisher Hachette, it has entered a phase of heightened aggression unseen even when it tried to crush Zappos by offering a $5 rebate on all its shoes or when it gave employees phony business cards to avoid paying sales taxes in various states. The truth is that American antitrust law is simply not very concerned with the fate of competitors. What it cares about is whether harm is being done to consumers. Walmart has squashed many more small competitors than Amazon ever will, with nary a peep from the antitrust police. Even in the one business Amazon does dominate — books — it earned its market share fair and square, by, among other things, inventing the first truly commercially successful e-reader. Even now, most people turn to Amazon for e-books not because there are no alternatives but because its service is superior. I’ll disagree with Nocera on a few points, including his line that Amazon earned its market share firmly: Amazon dodged sales taxes for years, setting up unfair competition that allowed it to crush brick-and-mortar bookstores that were not exempt. If we’re talking about getting the government to force a breakup or downsizing of Amazon, then “debating terminology” – i.e., the meaning of monopoly – isn’t chattering-class hair-splitting; it’s the heart of the matter. Someone needs to read Malcom Gladwell’s book, David and Goliath and figure out how to counter Amazon by using their size and data mining against them. Independent bookstores could band together for a web based mail order system run like Snapchat; I.e. purchase history of customers is purposefully not stored but erased. Mr. Timberg, I fear that your comments are wrong-headed in virtually every regard, large and small. The behavior that appears to concern you primarily is Amazon’s market power relative to publishers, not consumers. As such, the term you should be tossing around is monopsony, not monopoly. Nevermind that Amazon isn’t anywhere close to meeting a legal threshold for constituting a monopsony (or monopoly), you do realize that it’s not illegal to be a monopoly/monopsony, and that it’s not illegal to wield market power, right? And of course, that actually possessing market power doesn’t render one a monopoly/monopsony. Take for example, Apple, who by market share is clearly nowhere close to either monopoly or monopsony, yet which has pricing power power with both consumers (e.g., Apple makes somewhere close to 50% of all profits in the PC industry, while holding a market share in the range of just 10%), and with suppliers (where its huge volumes allow it to dictate terms to a great degree). Generally-speaking, what is illegal is to create a monopoly by acquisition of competitors (monopsony is more subtle, still) or to use monopoly powers in an improper fashion, such as tying (where monopoly power in one area is used to gain power in another area, via anti-competitive bundling). Joe Nocera makes the same terminology error, but he gets the analysis essentially correct. Your criticism that Amazon attained its market share due to unfair competition by dodging sales tax is both petty and false. Amazon followed laws that, for decades required traditional mail order companies, and later internet-based mail order companies, to collect sales tax only within jurisdictions where it maintained a physical presence. None of the thousands of other traditional mail order companies or internet-based competitors to Amazon achieved anything close to Amazon’s market share, so quite obviously, that achievement was not fundamentally about whether customers were paying taxes. Furthermore, after Amazon began collecting sales taxes (long before the vast majority of internet competitors, many of whom still do not), their numbers continued their fast climb. I seriously doubt you could find any numbers that suggest that sales tax was anything more than a very minor factor in sales, particularly in book sales, where the transaction totals (and therefore, the amount of sales tax per transaction) are typically quite small. The reality is simple: Amazon achieved its current market share by offering a compelling service to consumers. Amazon may or may not have behaved badly with respect to how it treats employees, or in other regards—though that is not relevant to the monopoly/monopsony question, and is pretty clearly not your concern, since you don’t even bother to mention such allegations. Rather, your root complaint is pretty clearly that Amazon wields its market power in dealings with publishers—presumably of personal parochial economic concern to you, as an author. You see Amazon as a bully, because it has, and is not afraid to use, pricing power in dealing with its suppliers: publishers. This is the complaint of a spoiled child, used to getting his way in everything, when he first confronts a denial of his wishes. Publishers (and authors) have, for centuries, enjoyed the leverage imbalance that came with wielding a state-granted monopoly over their product (i.e., copyright), making them a sole seller to a market of thousands of buyers, where even the largest buyers represented just a small fraction of the market. Now, suddenly, there is a buyer large enough to vastly reduce that leverage imbalance, so that the marketplace actually functions better, and publishers and authors cry “Bloody murder!” They now, for the first time, find that they can no longer set prices close to unilaterally. Were it not for Amazon, there might still not be any significant market for ebooks, and at a minimum, it would be much, much smaller. Were it not for Amazon, publishers would have pocketed all or virtually all of the very large systemic savings that come with ebook distribution, resulting in much higher costs for consumers, and almost certainly reducing output. These are the two key factors that go into evaluating anti-trust issues for monopsonies. Amazon is on the right side of both of them. But you would have us believe that Amazon is the bad boy in this dispute, as they, fight for lower prices for consumers, in the ebook market that they nearly single-handedly created. As a rule, sellers are free to set the prices and terms on which they are willing to sell products, and buyers are free to set prices and terms on which they are willing to buy. Amazon would be perfectly entitled to refuse to buy Hachette products altogether, if it so wished, and that wouldn’t constitute a violation of anti-trust. That it has taken the lesser step of still making Hachette titles available to its customers, while refusing to offer Hachette the benefit of promotion techniques it provides to publishers with whom it has agreed on terms is no violation, either. Nor is it unethical. Rather, it is a completely valid tactic in what is now a much better functioning marketplace for books than we have seen for centuries past. As for standing by, watching creative destruction—you should note that the term is used in economics to refer to beneficial economic innovation (with some near-term dislocation). In other words, it’s something that, in the long run, is good for society to stand by and watch. are you aware of any publishers who take a stand against Amazon by refusing to sell their titles there?